Common colds are not really all that common, we all get them and the symptoms are the same, including difficulty breathing, watery eyes, headaches, fever, aching muscles, stomachaches, sneezing, soreness in your throat, lymph glands, irritation or congestion in the respiratory tract and sinuses, nausea and fatigue. The thing that isn't common is the wide variety of rhinoviruses. Usually, once a person is infected with a particular strain, he or she may develop an immune defense to it. Children, however, with developing immune systems, can have as many as seven colds a year. Another problem is that there are enough strains out there that the average adult will be exposed to one or two new ones every year. Therefore, the common cold is hard to cure, because it has the ability to change and has hundreds of different forms. The first priority in treating colds, flu and viruses would be to take full control of the illness, being alert to the changes in your body that may indicate infection. The herbal combination may be a good start for prevention especially when you may be exposed to viruses and bacteria. They may help to shorten the duration, reducing complications such as bronchitis, coughs from colds, and other viral infections, in order to rebuild and support the immune system. Studies have proven that Elderberry herbal extract is effective in fighting viruses by stimulating the body's immune system and supplying it with significant antioxidant defense. Elderberry herbal tinctures are able to reduce extreme secretions mucus and inflammation of the mucous membranes, decreasing congestion in the nasal passages. Echinacea Angustifolia root extracts have many benefits and have been used for years for a number of medicinal purposes. Echinacea Angustifolia is a wonderful herbal tincture for staving off colds, pneumonia, and flu-like symptoms and is used today to for its influence on immune cell proliferation, antibody production, and antiviral activities. Echinacea Angustifolia extract is considered to be an antibiotic and antiseptic and it also fights off inflammation and blood impurities. Echinacea purpurea has been widely used against many infections of the upper respiratory system, especially the common cold. It is not commonly used as a preventative against colds, however, Echinacea purpurea has been found to be quite effective in fighting the symptoms once you have been infected. Echinacea extracts have also been used for other infections and related conditions of infection. 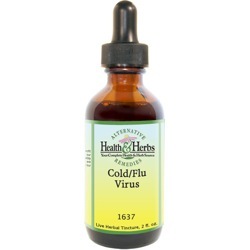 Goldenseal and Elderberry are two that are above the rest in this combination formula. The two herbs have been used, not only to fight colds and viral infections head on, but they may also help to fight the bacteria with the antimicrobial properties. Symptoms can be eased with Goldenseal's anti-diarrheal and anti-inflammatory actions, while the antioxidant properties of Elderberry provide further support to the immune system. Non-Alcohol: Elderberry (Whole), Elderberry Flower, Echinacea Angustifolia Root, Echinacea Purpurea Root, Goldenseal Root, Structured Water, and Vegetable Glycerin. Instructions: Use 6 to 12 drops in juice or water, under the tongue or as desired. May be used up to 3 times daily, but should not be used for more than three weeks at a time. Shake well. Store in a cool, dry place. Keep out of reach of children. Contraindications: See individual herbs for side effects.